When was the last time you cried? How long did you allow yourself to cry before putting the lid back on? Did it take you by surprise? Did you feel it building up and flowing over? Did you quickly wipe away your tears, or did you allow them to linger on your cheeks? I am intrigued by how people cry. Often, I watch them holding their breath in the moments before their tears appear. I feel their reluctance to let go. Then comes the biting of the lip as they look up to the sky, in the hope that the tears that are beginning to fall will defy gravity and roll back up. When their tears rebel against them and start to spill over, I wait to see how long it takes for them to reach for the Kleenex, or for someone else to offer them these magical white veils behind which they can hide and regain their composure. We are so conditioned to hide our emotions that tears are seen as a sign of weakness, or of losing control. We focus on “staying positive” and “looking on the bright side” so much that we forget that for every positive, there is a negative, and for every bright side, there is also darkness. It is in this balancing of Yin and Yang that peace and harmony is found. I cry almost every day. Not because I have a yearning to feel pain. Nor am I depressed. I am simply one of those people that never mastered the ability to swallow down the waves of emotion when I feel moved by what I see or hear. Movies, weddings, songs and heartwarming YouTube clips of animals regularly reduce me to a blubbering mess. Driving along listening to an old CD of songs that a client made for me as part of their ending process in therapy this weekend, two songs in particular made me sob: Rolf Harris’ “Two Little Boys,” and The Streets’ “Never Went to Church.” Yesterday, I wept upon reading this article about a beloved dog’s last day with his family and friends, this clip of a grieving dog, and when I saw this clip of a depressed goat being reunited with his best friend. This morning, I welled up when my horse wrapped her neck around me in a long hug after I bandaged her abscessed hoof. There’s a part of me that enjoys my ability to cry. Allowing myself the pleasure of all the sensations of crying reminds me that I am alive. To cry is to feel, to be moved, to yearn, to hope and to be impacted by the world around me. What pulls at my heartstrings the most are stories, memories, or images that remind us that life is transitory, precious, and relational. My tears represent my anticipation of grief, the yearning for more connectedness, and the hope for a more compassionate world. 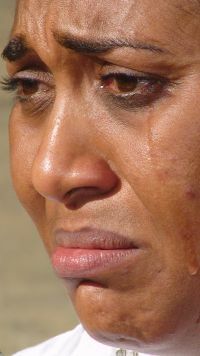 As a therapist, I encourage all my clients to embrace their tears, both physically and emotionally, giving them time to feel the tears on their cheeks and to honor the meaning of them. To embrace what moves them is to embrace what enlivens them. Allowing our hearts to fill with the emotions as they move us, whether it be joy, gratitude, despair, hope, pain, sadness, or a multitude of other feelings, enables us to live our lives more fully in the moment. Why would I want to brush all that aside and wipe it away with a Kleenex?